A Complete Wood-Fired Restaurant on Wheels. Create Your Dream Business. 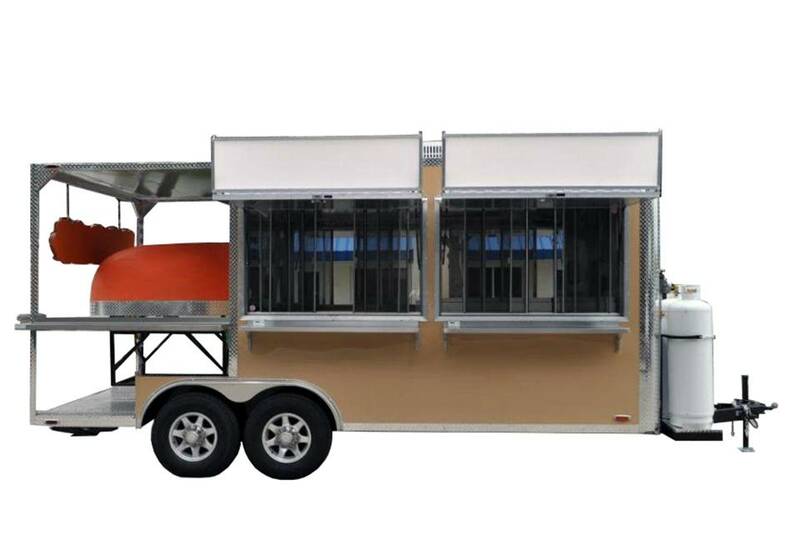 Introducing the Fire Within 22’ Cucina Wood-Fired Pizza Oven Trailer. This is a fully-enclosed pizza restaurant on wheels. This beautiful unit features a 6-foot porch which houses the oven dome. You’ll feed that oven with pizzas from the 16 feet of workspace inside the trailer. This mobile unit fits everything your business requires – and then some: A 3-basin disinfection sink (43-gallon fresh water and 50-gallon grey water tanks), a standup freezer and another standup refrigerator, a separate hand washing sink, a 67-inch refrigerated prep table, stainless steel work table space and shelving throughout the interior, a 10,000 watt generator, and an electrical package that powers 8 outlets (2 GFI) and two 4-foot fluorescent ceiling lights. Outlining your Cucina are two huge screened windows – your pizza trailer will be stunning, open and inviting. The included LED-lighted marquees above the awnings are just waiting for your brand to be displayed. Each window features a 1-foot by 5-foot fold-down stainless steel table inside and out.